New Winter 2018: The duck hunter on your list will enjoy one of these handsome hobby ornaments personalized for his tree. 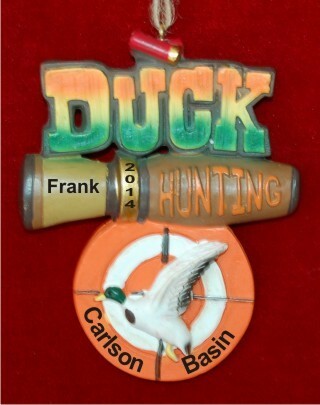 The duck on target hunting personalized Christmas ornament features a realistically styled duck call, target and duck in flight. These are personalized hunting ornaments, so we’ll add your custom details using a stylish font to create something special for your tree and a great gift for friends. The duck call hunting ornament personalized Christmas ornament arrives in our plush velvet gift bag, and it’s a great way to commemorate the enjoyment of the great outdoors or a particularly successful hunt.